Steinhart has released it’s newest model inspired by automotive racing and without doubt some famous race-related watches of eras gone by that have recently been released with great success. Clearly the Tudor Heritage Chronograph in blue springs to mind. The Racetimer features a 44mm case (16mm thick) which is made from titanium, and is powered by the ETA Valjoux 7750 (elabore grade) automatic movement. The movement features a golden rotor with the Steinhart logo cut out and this can be seen through the exhibition caseback. The contrasting colours on the sub dials makes those dials stand out from the small seconds, and (in the case of the blue and white dial) brings the timing function very quickly to the forefront, which would of course be of critical importance in a racing situation (he says somewhat tongue in cheek) . 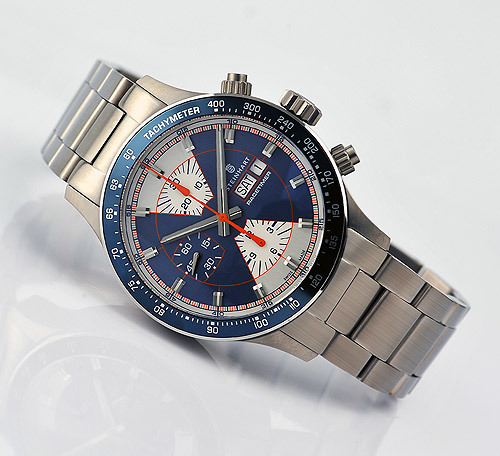 Additionally, you have a color-matched tachymeter inlay in the stainless steel bezel. Colour is definitely something you have some choice with here as well. I am torn between the classic blue-and-white combo and the brown dial with darker brown and cream accents. However, there is also a grey dial with black and white accents. As well as the choice in color, you can choose to pair the watch with a leather strap with contrast stitching, or a titanium bracelet. I was pointed at this watch by a fellow watch enthusiast and I have to say this for me is the most exciting watch I have seen this year. I like the style, I like the quality of the finish and I like the value for money that is inherent in all of Steinhart’s watches. This really is a watch that has gone to the top of the “We Wants Muchly” list here at Beastie Folly. Categories: Steinhart, Watch Blog, Watch Brands, We Wants Muchly | Tags: chronograph, Racetimer, Steinhart, Valjoux | Permalink. This look has been around for a good while now. Don’t quote me on this but I think Panerai might have been first off the blocks with this style but Bell & Ross have jumped in smartly too. Where these have led others have followed and why not? It is an attractive style that is very easy to market that definitely appeals to the Biggles in all of us. The Bell & Ross Vintage Heritage 123 shown above is the first of four that I want to show you here. This model currently retails at £1950 and arguably is the least value for money of the 4 shown here. However, that does not stop it being the most desirable. Simple style and a simple ETA 2824 movement but look at the attention to detail. The colour of the date matches the antique colouring on the rest of the dial. The curved domed saphire glass finish is a work of art in itself. The modest by today’s standards 41mm case size. All these features give it a consistency that matches its vintage style aspirations beautifully. The result of all this was that I fell in love with this watch the minute I put it on my wrist. A real winner. An expensive winner but winner nonetheless. Next to look at is the modestly priced (£124.99) Timex Intelligent Quartz Chronograph. 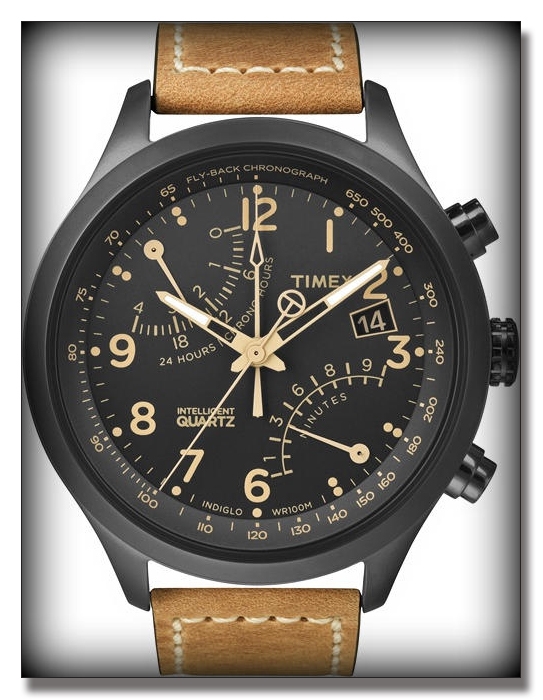 the Timex IQ watch features a black dial with quartz flyback chronograph movement, date window at 2.30, a second time zone and an indiglo night light to improve visibility in low light conditions. Set within a 43mm black steel case and secured by a tan leather strap with pin and buckle. And water resistant to 100 metres. A very good looking watch at a jolly fine price with quartz accuracy. My first ever watch was a Timex back in about 1965 and another is long overdue. I hope to add this to my collection shortly. This pilot watch Nav. B-Chrono II black DLC is another chronograph made by STEINHART with the tried and tested ETA VALJOUX 7750 elabore automatic movement.The series of Nav.B-watches II is completed by this watch with its beautifully crafted stainless steel case with black DLC coating, with matt finish and the large historical diamond crown.The Nav.B-Chrono II black DLC makes every watch enthusiast’s heart beat faster. The domed sapphire glass with double anti-reflecting coating on the interior side and the dial with vintage “old radium” hands make this pilot watch so special. The design of the dial should be particularly pointed out. All Arabic numerals are fully readable on the dial and the two sub-dials on 6 and on 9 were used twice.A comparable pilot watch with such an excellent price/performance ratio will be hard to find. 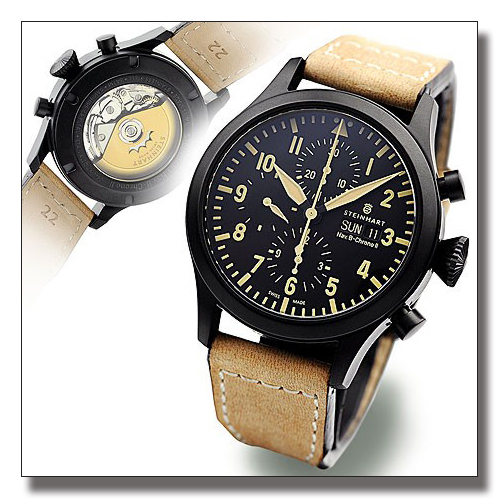 A must-have for every lover of pilot watches! This says all you need to know. Yes I would love one but the sheer value of the Timex just trumps it while the understated quiet styling of The Bell & Ross – a clear winner keeps this one in third place. 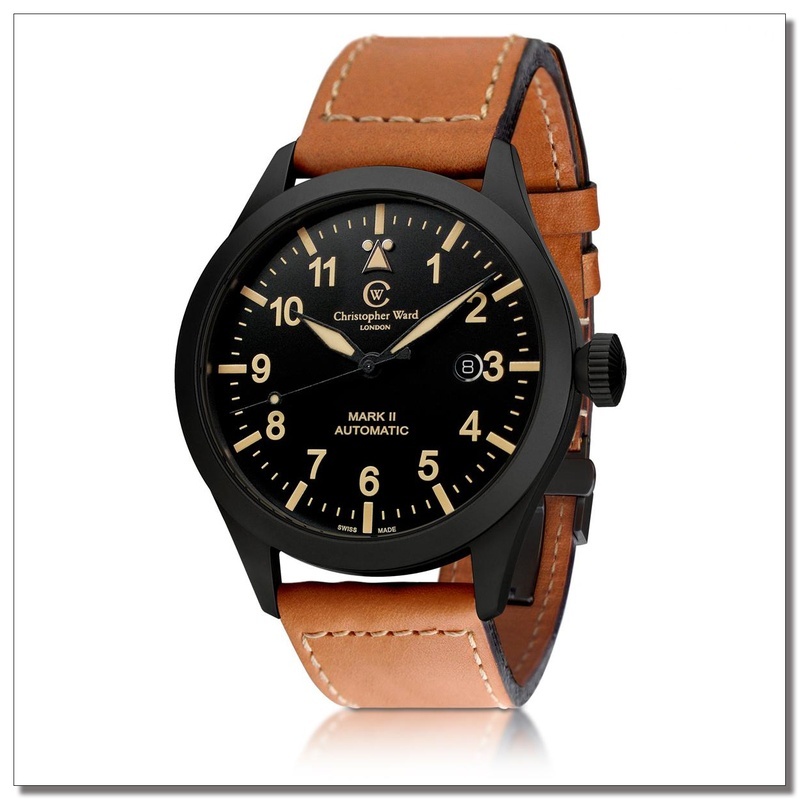 Finally we have the Christopher Ward C8 Vintage in black. I have long been a big fan of Christopher Ward and the C8 especially. They have other versions of the C8 which I love too. However, for me the C8 Vintage has a few flaws I cannot ignore. First the strap is way too big! Yes I have small wrists and this is a big watch at 44mm but Hamilton’s Big Pilot at 46mm fits my wrist straight out of the box and in truth I have never tried a watch on yet that will not adjust to fit. But this one wont! All the other Christopher Ward watches fit but not this one. This one needs an extra hole adding to the strap and for me that is just not good enough on a £415.00 watch. Secondly, the date on the date wheel is white. I am sorry but having seen the Bell & Ross I just can’t live with that. Thirdly, the hands are edged in black which makes them seem thinner. Look again at the other three models and notice that they are different. It is all in the detail. This is a great watch that its owners will love and rightly so, but for me it is the C8 I want to like the most but is probably a poor third to the white and the black faced non vintage versions of the watch. Four great Vintage watches at 4 price points from just over a £100 to just shy of £2000! If only money grew on trees! Categories: Bell & Ross, Christopher Ward, Steinhart, Timex, Watch Blog | Tags: aviator watch, Bell & Ross, Christopher Ward, Steinhart, Timex | Permalink.